You know what hasn’t happened to me in a while? No, no, I get plenty of exercise, I went running just today! I’m talking about that feeling of knowing that my dinner is going to be goooooood – the extra o’s emphasise just how good. 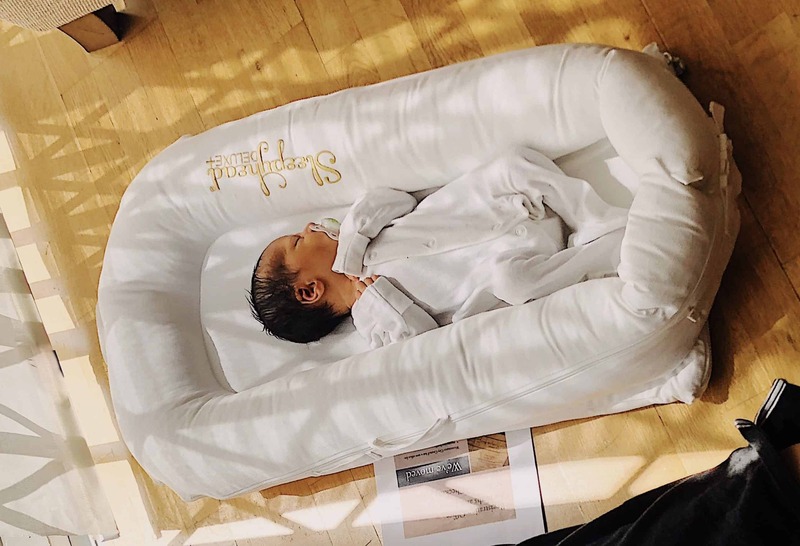 It’s the best sort of feeling to have (well, almost the best 🙂 ), especially when you write about halal restaurants for a living, and it has only ever happened a handful of times since HGAT has been born. 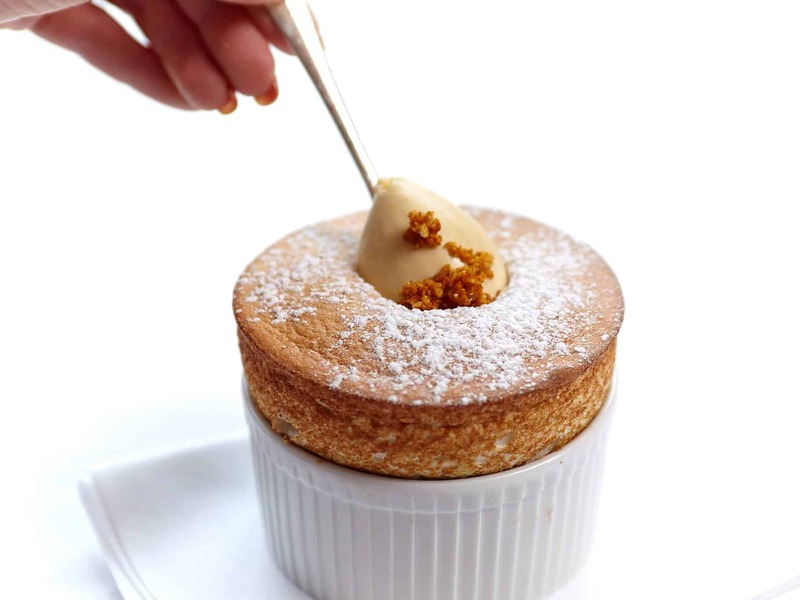 The first was at The Ledbury, the only 10/10 for food on HGAT. 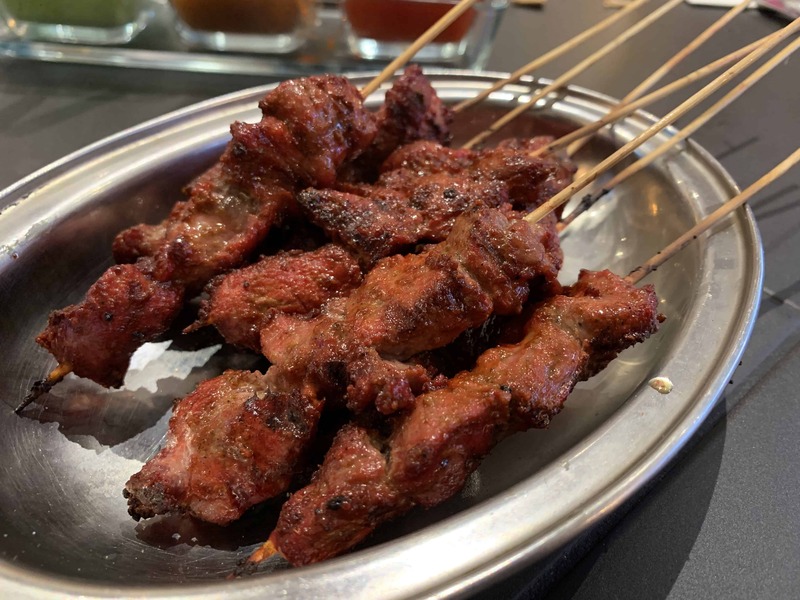 I walked in with the expectation of having an outrageously good meal, and boy, was I blown away (sadly, it is no longer halal!). 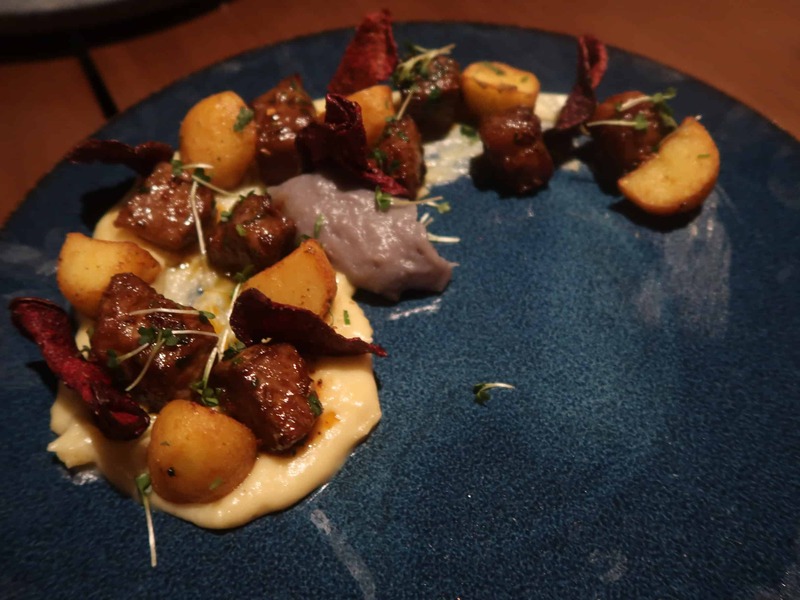 The second was Cut by Wolfgang Puck in Dubai; I knew I was going to have the best steak of my life, and I was beyond happy with my Japanese wagyu. But this was sadly a while ago, and I’ve been waiting ever since for one of those meals. 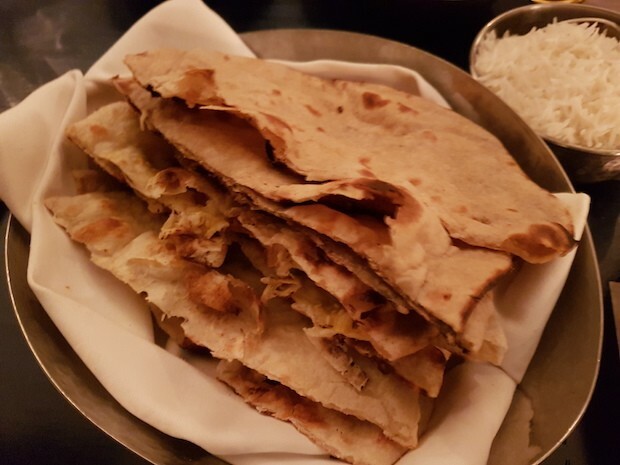 Jamavar is a fairly new Indian restaurant based in Mayfair, and is led by Rohit Ghai, the former executive chef from the likes of Gymkhana and Benares. 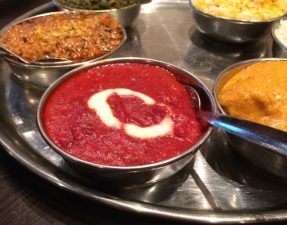 I admit, I wasn’t the first to jump at the chance of eating at an Indian restaurant, but reading about all the hype got me a little excited as we headed there on a Friday evening for BW’s friends birthday. The first and only vegetarian dish of the evening. 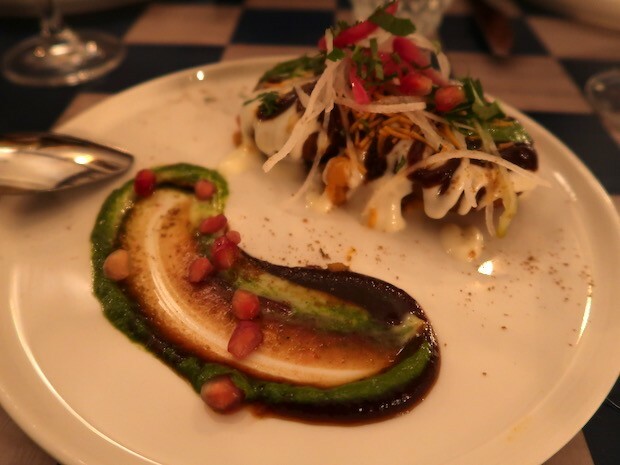 A crispy potato tikki that was topped with a sweet honey yoghurt, tamarind sauce, spicy green chutney, crispy sev, shavings of white radish, and pomegranate seeds – phew. 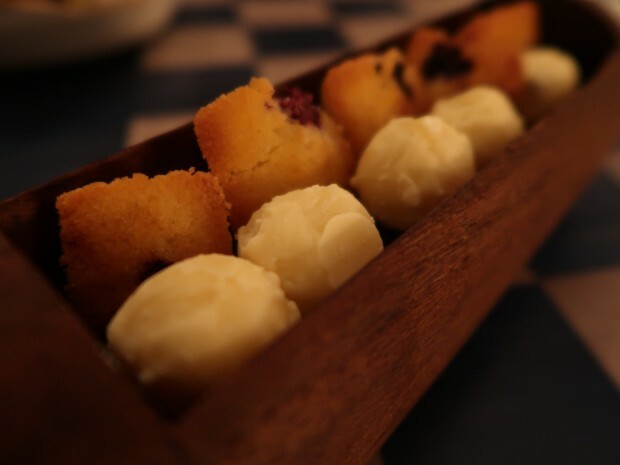 Each bite was an explosion of flavours, from sweet to spicy, and contrasting textures, both crunchy and creamy. It was a delightful start to the meal. 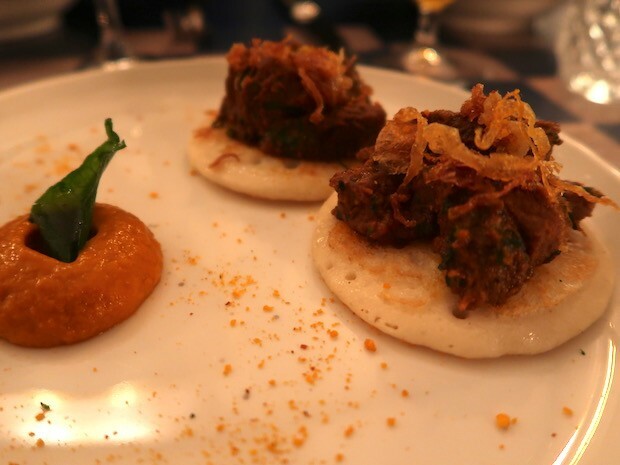 Slow-cooked beef served atop a rice pancake that was made with cream of wheat. The beef had been cooked with mustard giving it a slight tang and was super soft and tender. A mouth-meltingly soft kebab that had used kid goat plus lentils and black cardamon. 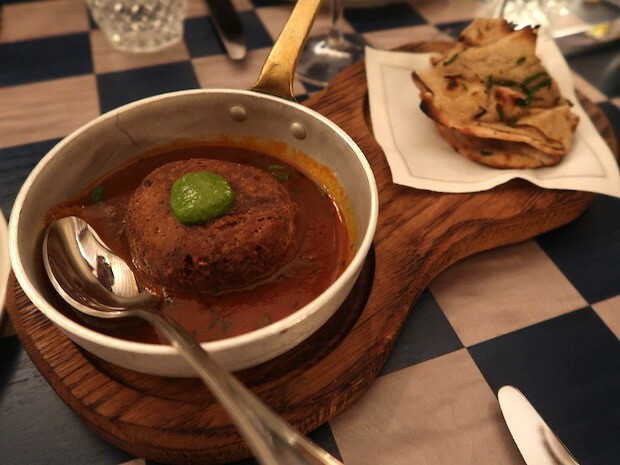 It sat upon a meaty bone-marrow sauce, and served with flaky buttery paratha. The below items are from the £60 tasting menu, and the attached prices are for the a la carte options. 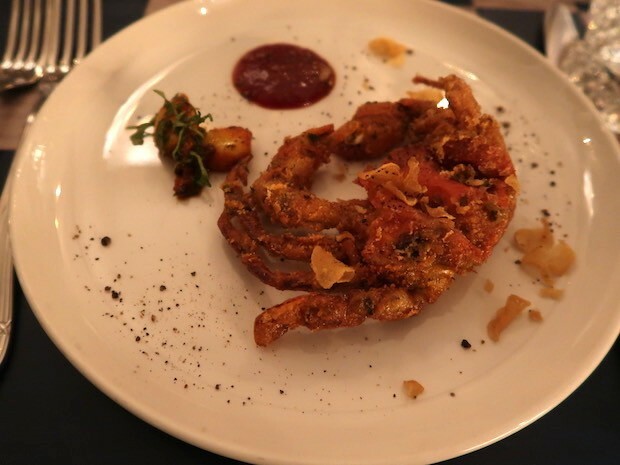 A medium sized crab that had been deep-fried and dusted in garlic and pepper. Whilst it was fun tearing off it’s legs and dipping into sauce, I felt that it needed to be crunchier and have a lot more of a kick. 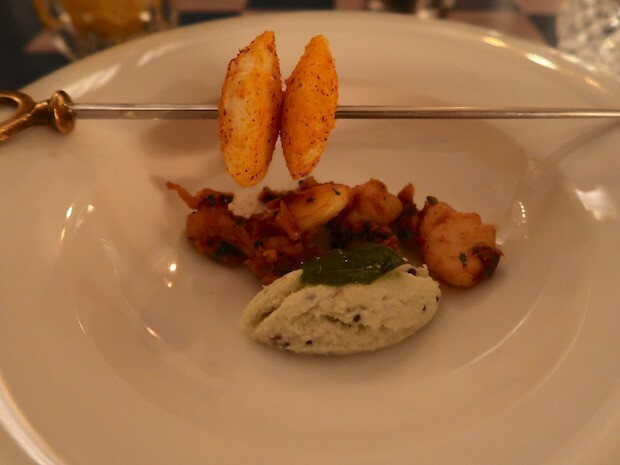 Sweet soft lobster chunks arrived with a skewer of cute mini idlis and a dollop of coconut chutney. 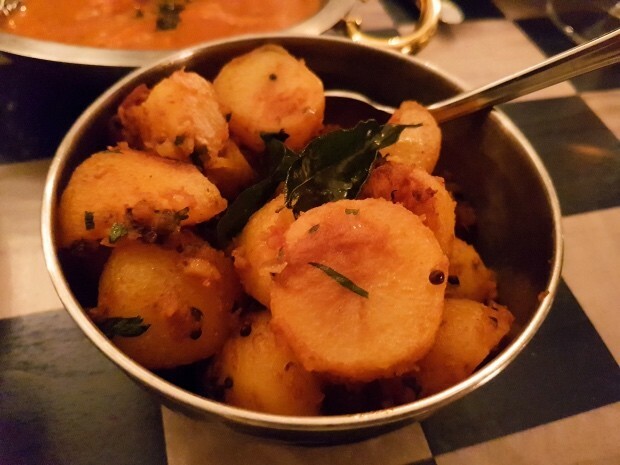 For some extra pizzaz, the waiter removed the idlis from the skewer and poured in piping hot aubergine sambar, which seemed to differ between each diner as BW got a small helping on the side whilst my dish was full! 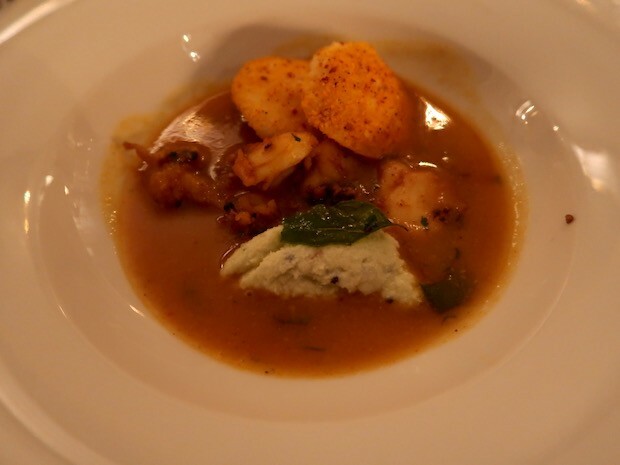 The idlis soaked up the sauce but remained intact without becoming all mushy, and were a good accompaniment to the black-pepper dusted lobster. 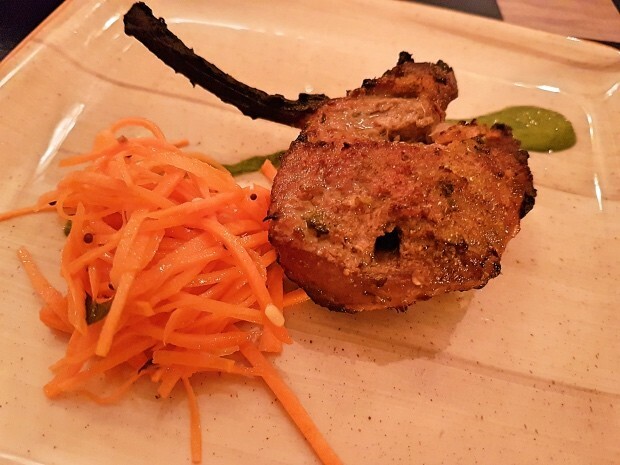 If you were to visit Jamavar, the one thing I would tell you that you HAVE to order is the stone bass tikka. 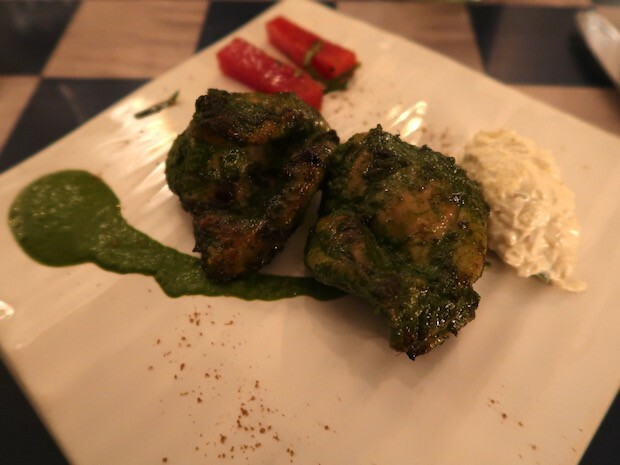 This stone bass – not sea bass – was cooked in cream to make it tender and had a good smokiness from the tandoor. 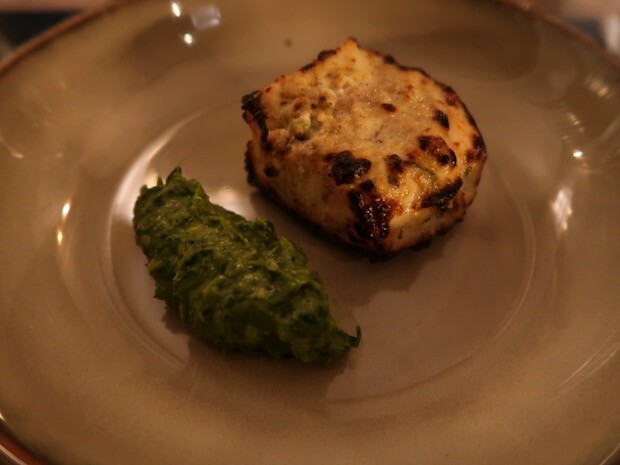 Everyone around the table was in awe at how fantastic it had been cooked, the subtle flavours that this juicy, flaky fillet of bass packed, and the delicious avocado chutney it was served with. It was stunning and was the best dish of the evening by far, and thats saying a lot. 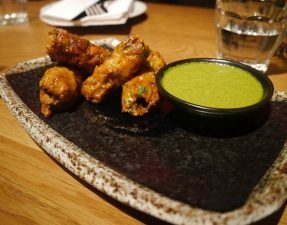 Two cubes of chicken that had been smothered in a vibrant green basil marinade, and expertly grilled to give it a good char. It was a little unfair to follow on from that magnificent stone bass, but nevertheless was a great dish. A simple meaty lamb chop that was deliciously smoky and rich with royal cumin. Biting in, it was beautifully pink and juicy. 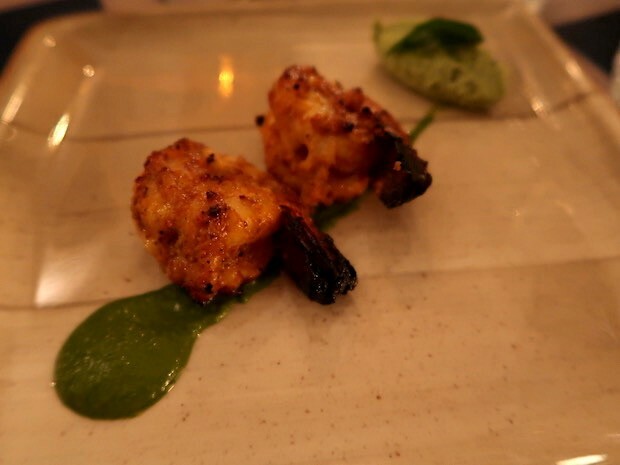 Two succulent tiger prawns that had come fresh from the tandoor and lightly marinated in a traditional spice mix of cardamom, cumin, coriander, and other southern spices. 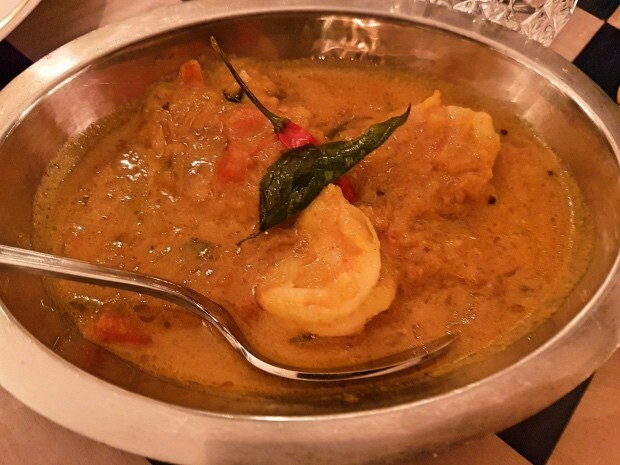 A light coconut-based curry made with shallots, zingy mustard seeds, and raw mango, anda generous amount of fresh prawns mixed in. It wasn’t as thick and rich as the other curries, but had a nice, simple sweetness to it which went well with the hot tandoori naan. 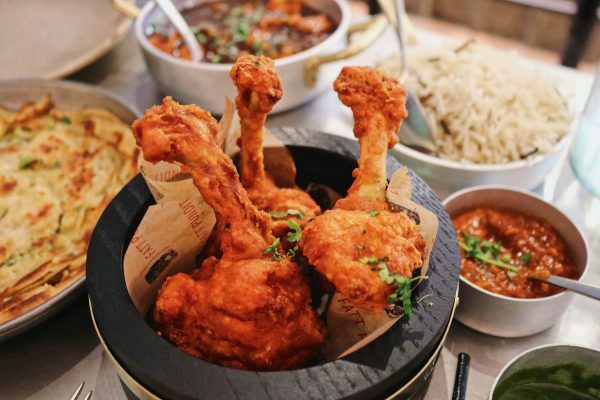 A staple Indian curry which was indulgently creamy, and mixed-in grilled corn-fed chicken which was tender and slightly smoky. 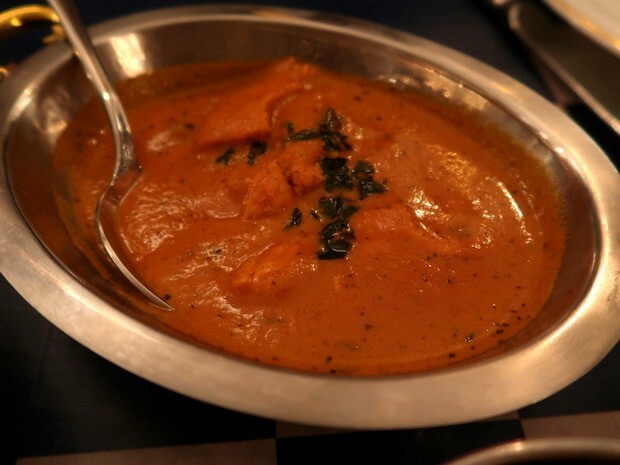 It was good, but not a dish that really stood out to me, and perhaps this was because I had the expectation of eating an outrageously good butter chicken. 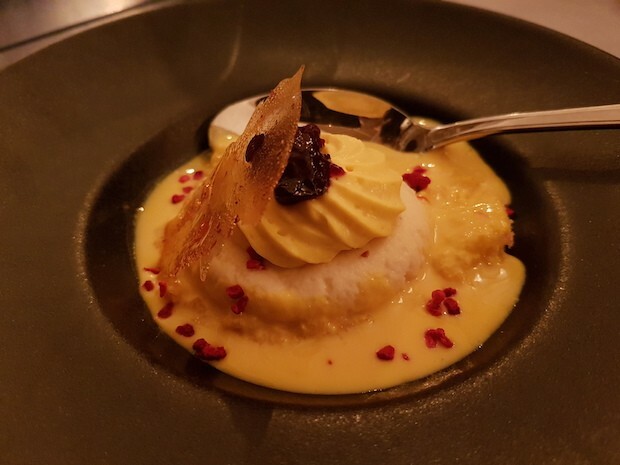 A large rasgulla (cottage cheese ball) that lay upon a wheat biscuit in a pool of a cream-based alphonso mango sauce, and topped with a mango whipped cream, a tart berry chutney, and a caramelised sugar shard to finish it off. This was nice and light, but did not stand out to me, especially when you read about the next two desserts. 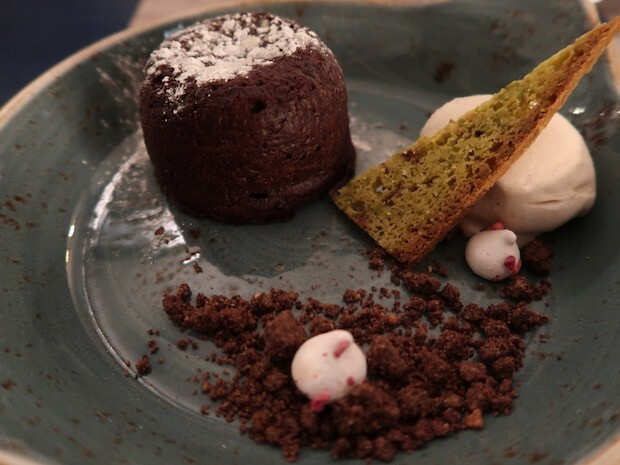 Jamavar’s soft chocolatey cake burst with a chilli-infused chocolate liquid when cutting into and was served with candied pecans, chocolate crumb, crispy mini meringues, and a cinnamon kulfi. I’m not generally a fan of the chilli and chocolate combination, but Jamavar’s fusion was quite subtle, and there was more of a spice kick from the creamy cinnamon kulfi. A well-executed dessert, but just wait till I tell you about the last dessert omg. 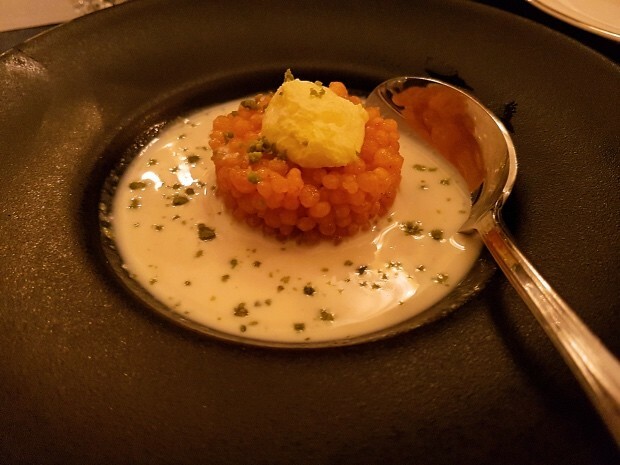 And because you can’t go wrong with getting a third dessert, we opted for the jelebi caviar with rabri, saffron cream, and a masala & pistachio infused milk. Not knowing what to expect, I was beyond pleasantly surprised when this dessert arrived to the table. The syrupy caviar just popped and melted in the mouth, and the nuttiness from the milk helped to tone down the sweetness. It was a great dessert, and jelebi just won’t be the same to me! The overall bill amounted to £180, including drinks and service, so £90 per person. Oh la la, BW’s credit card definitely took a hit that day, but keep in mind that we were in a group and had ordered a few additional items on top of the 7-course tasting menu we each had, plus an abundance of drinks. I’m going to put it out there and say Jamavar is the best Indian restaurant in London right now. Almost every dish we had was fantastic and well executed, and I cannot wait to return to check out the a la carte options. 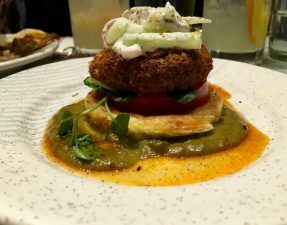 If you do plan on visiting, I suggest going for the tasting menu (£60) so you can try a little bit of everything and although the portions may seem small, we were beyond full come course 4. 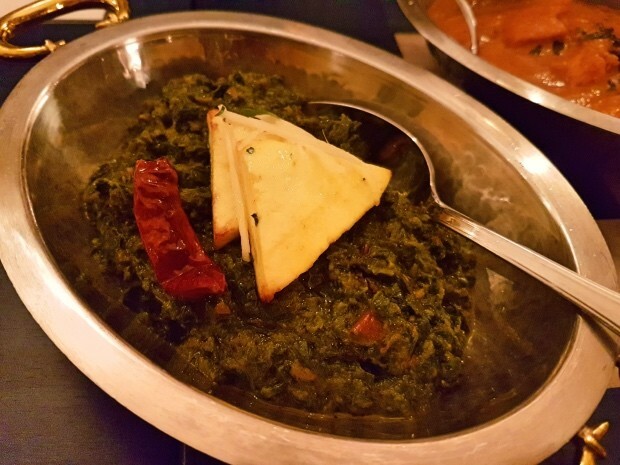 Whilst the food at Jamavar was flawless, the same cannot be said about the service on that night. What should have been a two-hour tasting menu experience, turned into a 3-hour extravaganza with extremely long waits between the courses, but I’ll put that down to us being in a large group. Something that cannot be blamed on the party number is that our drinks were constantly forgotten or arrived at least 20 minutes after being ordered, and the ultimate cherry on top, was an alcoholic drink being served to BW. I’ll put it down to a one-off as I’ve read raving reviews about their service, but it did put a little bit of a damper on the evening and we couldn’t wait to get home. Nice review! Not sure if it’s something you’re too concerned about but I think unless you’re a Maliki I don’t think crab is halal. I may be wrong on that.